A large adult bald eagle is seen fishing close to the shoreline at a beach in Alaska, as it swoops down to collect a fish in its telons. With outstretched wings, a graceful bald eagle flys down near the water's edge with telons ready to pluck a fish from the water. This adult bald eagle spent some time fishing at this spot before finally catching a fish and flying off with it in its telons and allowing another eagle to fly in to do the same. American Bald Eagle with spread wings ready to catch a fish. 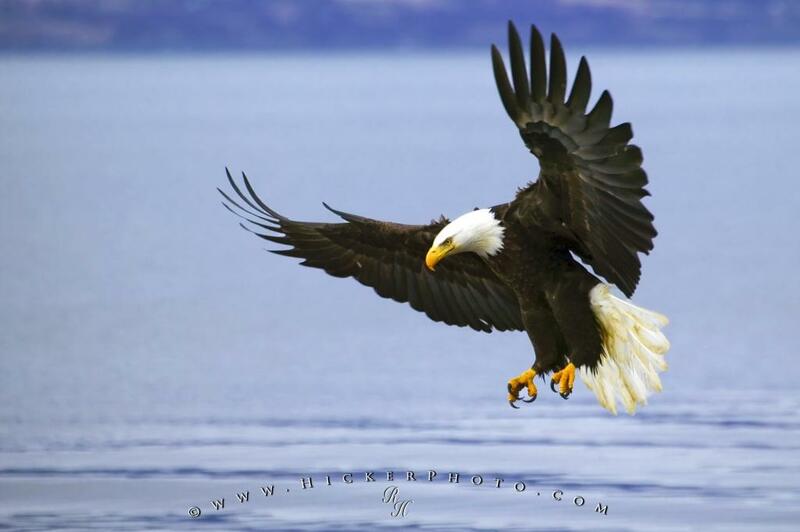 Photo of an adult bald eagle, fishing by swooping down near the shoreline to catch fish.